River Valley senior Chelsea Copley (14) makes a throw to first base during a non-league contest against Gallia Academy in Centenary, Ohio. Copley, who is headed to Wooster for softball, was a first team selection to the 2015 OHSFSCA Division III All-Ohio softball team. 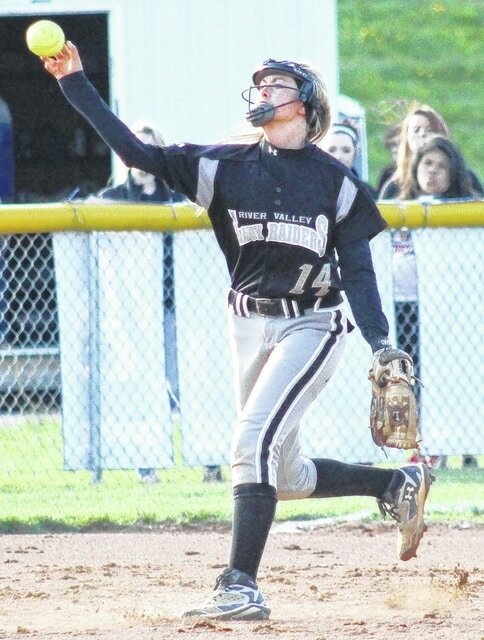 COLUMBUS, Ohio — The Ohio Valley Publishing area had two players named to the Ohio High School Fastpitch Softball Coaches Association All-Ohio teams for 2015, as voted on by the coaches within the Buckeye State. River Valley senior Chelsea Copley was a first team selection on the Division III team, while Eastern freshman Sidney Cook was an honorable mention choice in Division IV. Copley and Cook were just two of the 24 players chosen on behalf of the southeast district in the four divisions. Logan’s Faith Freeman and Grayce Huntsberger were part of the Division I squad, while Brook Blevins of Unioto, Darbi Brewer of Circleville, Kerstin Thoruburgh of Hillsboro, Kacee Jenkins of Jackson, Ashley Grow of Waverly, and Maddy Conrad of Logan Elm were the district’s represenatives in D-2. Michal Cunningham and Kalle Coleman of Wheelersburg, Regan Stonerock of Westfall, Jill Hairston of Rock Hill, Kendall Meeks of Alexander, Alayna Lytle of Huntington Ross, Ashley Webb of Valley, and Mikayla Purdy of Eastern Brown joined Copley on the D-3 squads. Kaitlyn Payne and Taylor Webb of Symmes Valley, Kiley Sosby or Whiteoak, Kaitlin Evans of Leesburg Fairfield, Cami Whitley of Portsmouth Clay, Mikayla Wyke or Pike Eastern, Brooke Pierron of Portsmouth Notre Dame, and Jade Spriggs of North Adams joined Cook on the D-4 teams. Gallia Academy, Meigs, Southern and South Gallia did not have a player chosen to any of the respective teams. Kori Caughenbaugh, Licking Valley; Tori Walker, Jonathan Alder; Abby Barker, Granville; Kate Bass, John Glenn; Cassie Thomas, West Holmes; Deanna Cole, Springfield; Summer Constable, Keystone; Lexi Zappitelli, Conneaut; Lexie Handley, Akron SVSM; Kayla Wulf, Maumee; Julia Miller, Lima Bath; Abby Srgo, Lexington; Brook Blevins, Unioto; Darbi Brewer, Circleville; Ally Russell, Greenville; Learic Kinser, Kenton Ridge; Hayley Hudson, Ross. Alexis Van Ooyen, Bishop Hartley; Cambry Arnold, Caledonia River Valley; Kori Locke, Licking Valley; Madison Riggle, Maysville; Abby Tatgenhorst, Meadowbrook; Sammie Stefan, Keystone; Rachel Tinkey, Canfield; Lauren Shaw, Keystone; Bailey Byers, West Branch; Carly Santoro, Bellevue; Emily Lipstraw, Sandusky Perkins; Chelsea Imus, Edison; Kerstin Thoruburgh, Hillsboro; Kacee Jenkins, Jackson; Ally Ivey, Ross; Kaitlyn Stocker, Tippecanoe; Kate Campbell, Benjamin Logan. Breanna Brownfield, Lakewood; Madelyn Johnston, Jonathan Alder; Kacey Morris, Buckeye Valley; Kerrie Dolick, John Glenn; Paige Geanangel, Indian Creek; Daniele Rivera, Brooklyn; Kelly Hysong, Fairless; Abbey Yaugher, Holy Name; Alyssa Windau, Shawnee; Kennadie Goth, Shelby; Alyssa Manley, Lima Bath; Ashley Grow, Waverly; Maddy Conrad, Logan Elm; Faith Hensley, Monroe Central; Patton Akers, Franklin; Jordyn Cordell, Wilmington. Taran Alvelo, Bloom Carroll; Emily Clark, North Union; Taylor Bowman, West Jefferson; Adrian Smith, St. Clairsville; Chloe Otte, Sandy Valley; Lexi Falde, Waynedale; Elizabeth Birkbeck, Orrville; Sarah Wickline, Loudonville; Jessi Ducat, Evergreen; Haley Hawk, Parkway; Miranda Bensohoter, Elmwood; Michal Cunningham, Wheelersburg; Regan Stonerock, Westfall; Chelsea Copley, Bidwell River Valley; Natalie Higgins, Madison Senior; Kayla Seigla, Georgetown; Kaitlyn Moore, Springfield. Kelly Mix, Liberty Union; Abby Davis, North Union; Khyla Jones, Cardington; Abbie Hughes, Sandy Valley; Katie Ellzy, Harrison Central; Hallie Ward, Kirtland; Shannon McGee, Berkshire; Kayla Troyer, Waynedale; Haley Robbins, Fairview; Lindsay George, Elmwood; Maddy Rathbun, Oak Harbor; Kendall Meeks, Alexander; Jill Hairston, Rock Hill; Alayna Lytle, Huntington Ross; Carly Allen, Waynesville; Savanna Brown, Blanchester; Amara Wylie, Dixie. Megan Hatfield, Northridge; Kipley Detwiler, Bloom Carroll; Geirgie Stacy, Pleasant; Amber Immell, Garaway; Michaela Miller, St. Clairsville; Samantha Achauer, Kirtland; Haylee Gardiner, Champion; Emilee Flynn, Canton Central Catholic; Madison Kohler, Archbold; Ali Cheek, Tinora; Kaylie Dickman, Margaretta; Ashley Webb, Lucasville Valley; Mikayla Purdy, Eastern Brown; Kalle Coleman, Wheelersburg; Hailee Loughman, Brookville; Jenna Shepherd; Kris Bigelow, Miami East. Cerena Woodgeard, Berne Union; Bri Staats, Danville; Megan Heagney, Shadyside; Sydney Anderson, Tuscarawas Catholic Cnetral; Dayna Denner, Cuyahoga Heights; Cheyenne Eggens, Mathews; Ashley Burns, St. Joseph Central Catholic; Allison Brickel, Hicksville; Kara Scherger, New Riegel; Hannah Johnson, Arlington; Courtney Stoltz, Arlington; Kaitlyn Payne, Symmes Valley; Kiley Sosby, Whiteoak; Kaitlin Evans, Leesburg Fairfield; Morgan Arbogast, Covington; Hannah Watkins, Triad. Shanna Mickley, Danville; Lynsey Meeks, Worthington Christian; Gabrielle Fredricks, Tuscarawas Catholic Central; Keri Renzler, Bridgeport; Lauren Goetz, Cuyahoga Heights; Aleah Hughes, Western Reserve; Taylor Arbogast, New Riegel; Michaela Bauer, Hicksville; Nicole Miller, Van Buren; Taylor Farmer, Riverdale; Addy Bame, Hardin Northern; Cami Whitley, Portsmouth Clay; Mikayla Wyke, Pike Eastern; Brooke Pierron, Portsmouth Notre Dame; Janell Hoying, Fort Lorarmie; Hannah Trent, Houston. Rowan Rine, East Knox; Brooke Swinehart, Millersport; Alex McComb, Steubenville Catholic; Olivia Ray, Strasburg; Kailey Minarchick, Columbia; Paige Summers, Dalton Local; Meghan Reiter, St. Wendelin; Aubrey Bickford, Kansas Lakota; Britnee Johnson, Arlington; Megan Johnson, Arlington; Konti Martin, Ayersville; Jade Spriggs, North Adams; Sidney Cook, Eastern; Taylor Webb, Symmes Valley; Megan Rutledge, Newton; Maria Herron, Russia.